Originally I was very hesitant to read a book of poems that was inspired by a successful book and movie, particularly one that was dedicated to an actor that has shot to fame due to the instant success of the movie, “Twilight”. Whether this was due to my own personal feelings towards the book or simply the thought that it seems like a cheap way to publish an otherwise unrelated book of poems, I was unsure. 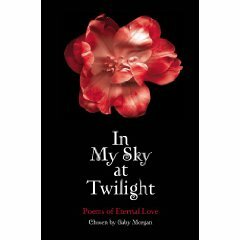 “In My Sky at Twilight” is an anthology of love poems aimed towards the 14+ market. Its eponymous poem by Pablo Neruda opens the book, which is followed by a mix of both classic and contemporary poems. Many of the poems were well known, generic poems about love (obviously the book included Shakespeare’s infamous Sonnet 18 and Byron’s She Walks In Beauty) and after reading the book in one straight sitting, I realised that there is only so many poems on the same theme that you can read without getting bored. However this is not necessarily a reflection on the book – it is an enjoyable read for dipping in and out of, and there are some remarkable pieces of contemporary poetry in there, especially the work of Gareth Owen; who’s poetry seems to speak directly to the mind of a 14 year old (tales of love at school, putting notes in lockers and falling in love with strangers on a train) and the work of e.e.cummings who is always an interesting read. I would recommend the book for its target audience, although if given to anyone older they may not enjoy it as much. I feel it will sell well due to its relation to the popular movie and novel “Twilight”, though many may be disappointed due to the actual lack of “Twilight” related facts and poems. However regardless of this it is an enjoyable book for the collection of poems it showcases. Overall, an enjoyable occasional read, but not something I would rush out to buy. For any “Twilight” mad fans out there, don’t go wasting your money on this.